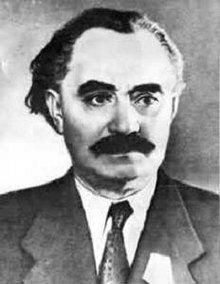 Georgi Dimitrov Mikhaylov (Bulgarian: Георги Димитров Михайлов) (June 18, 1882 – July 2, 1949), also known as Georgi Mikhaylovich Dimitrov (Russian: Георгий Михайлович Димитров), was a Bulgarian communist dictator, who was appointed General Secretary of the Communist International (Comintern) from 1934, remaining in office until the organization's dissolution in 1943. With the development of the very deep economic crisis, with the general crisis of capitalism becoming sharply accentuated and the mass of working people becoming revolutionized, fascism has embarked upon a wide offensive. The ruling bourgeoisie more and more seeks salvation in fascism, with the object of taking exceptional predatory measures against the working people, preparing for an imperialist war of plunder, attacking the Soviet Union, enslaving and partitioning China, and by all these means preventing revolution. The imperialist circles are trying to shift the whole burden of the crisis onto the shoulders of the working people. That is why they need fascism. They are trying to solve the problem of markets by enslaving the weak nations, by intensifying colonial oppression and repartitioning the world anew by means of war. That is why they need fascism. No, fascism is not a power standing above class, nor government of the petty bourgeoisie or the lumpen-proletariat over finance capital. Fascism is the power of finance capital itself. Ch. 1, The Class Character of Fascism. The Social-Democratic leaders glossed over and concealed from the masses the true class nature of fascism, and did not call them to the struggle against the increasingly reactionary measures of the bourgeoisie. They bear great historical responsibility for the fact that, at the decisive moment of the fascist offensive, a large section of the working people of Germany and of a number of other fascist countries failed to recognize in fascism the most bloodthirsty monster of finance capital, their most vicious enemy, and that these masses were not prepared to resist it. What is the source of the influence of fascism over the masses? Fascism is able to attract the masses because it demagogically appeals to their most urgent needs and demands. Fascism not only inflames prejudices that are deeply ingrained in the masses, but also plays on the better sentiments of the masses, on their sense of justice and sometimes even on their revolutionary traditions. Why do the German fascists, those lackeys of the bourgeoisie and mortal enemies of socialism, represent themselves to the masses as "Socialists," and depict their accession to power as a "revolution"? Because they try to exploit the faith in revolution and the urge towards socialism that lives in the hearts of the mass of working people in Germany. Ch. 1, Is the Victory of Fascism Inevitable ?. On the topic of supplying weapons to the Eighth Route Army, this needs the decision from the USSR; it is of the USSR's opinion that, had the weapons been supplied, instead of helping you(Chinese Communist), it would only harm you....Because it would help to deteriorate the relationship between KMT and CCP, and give excuses for the KMT to isolate and apply sanction on Yan'an. Finaly,...Comintern made a gift of US$300,000 to CCP. As Soviet power grows, there will be a greater aversion to Communist parties everywhere. So we must practice the techniques of withdrawal. Never appear in the foreground; let our friends do the work. We must always remember that one sympathizer is generally worth more than a dozen militant Communists. A university professor, who without being a party member, lends himself to the interests of the Soviet Union, is worth more than a hundred men with party cards. A writer of reputation, or a retired general, are worth more than 500 poor devils who don't know any better than to get themselves beaten up by the police. Every man has his value, his merit. The writer who, without being a party member, defends the Soviet Union, the union leader who is outside our ranks but defends Soviet international policy, is worth more than a thousand party members.